The other thing that distinguishes the sparkling new five star property is its man-made lagoon, another first for Fiji. To the untrained eye, it’s hard to tell the difference however this set up means the resort offers incredible views from almost everywhere. 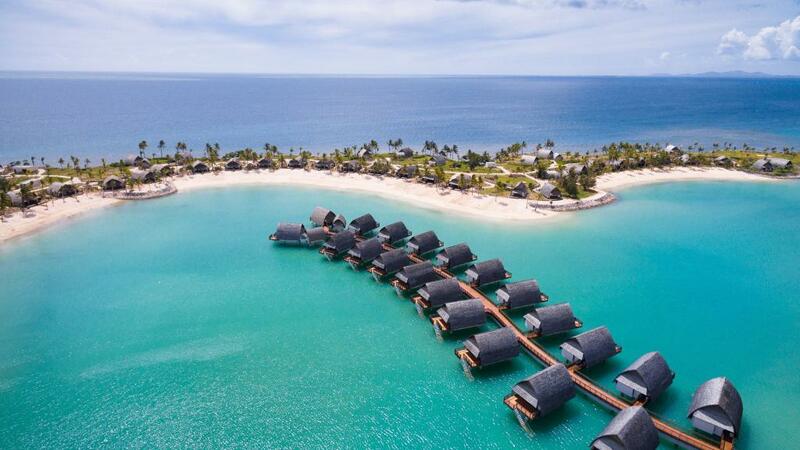 Although the sophisticated new resort features a total of 250 rooms, each decorated with a contemporary style that incorporates traditional Fijian motifs and natural materials, there are only 22 overwater bure villas making them pretty exclusive hot property. The shining star of Coral Coast accommodation, the new luxury resort is situated on the western coastline of Viti Levu and is just 45 minutes from Nadi International Airport. Aside from the accommodation, the resort also offers some incredible culinary and dining experiences as well as private beach access and an equally-impressive range of onsite facilities. Although guests of the overwater villas enjoy direct lagoon access right from their back stairs, there are also three swimming pools for all guests to enjoy with popular surfing and diving spots located nearby. Boasting uninterrupted views of the Coral Sea, the resort also offers a deluxe day spa, a swim up bar, kids club, four restaurants and room service. Whether you want to spoil yourself or someone special, it’s the perfect spot for an idyllic overwater holiday and is much closer and cheaper than some of the more iconic overwater destinations like Tahiti and the Maldives.